Cities planning their future are increasingly turning to the production of Integrated Urban Models. These are tools that bring together various datasets on different asoects of urban performance, from the behaviour of people to the flows of energy, water and other utilities. The aim is to better predict the future of cities by better understanding how they are currently working. Great placemaking is a process combining art and science. There is a place for both and indeed a need for both. Two problems. First, urban planning is largely an analogue discipline. Too many diagrams and watercolours. Not enough science. And, when science is present, it is seen as an adjunct, not as a driver. On Friday I gave a presentation at a Design Council CABE event, “Inside Design Review”. My talk, “Approaching large scale urban design schemes“, sets out a framework for thinking about the complexity of major urban development proposals. There is so much interest, from so many different interests, in the future of urban living. This suggests that, whatever else, people suspect that things will change. I’m sure this is right – technology, resource scarcity, population growth, energy shortage and climate change: all are factors that will provoke change. The question is, will these changing “inputs” affect the shape and form of the “output” ie the look and feel of the city? Again, the short answer is “yes”. But not in a sci-fi, megalopolis, flying cars kind of way. Nor in a “let’s all abandon the city and live in rural bliss, connected to each other by the Internet”. The reality, if done well, will look and feel strikingly familiar. We will in the main, by necessity, live at density and travel on foot and by bike, making lots of small journeys and a few larger ones. Likewise we will, by necessity eat local, reduce, recycle, reuse. 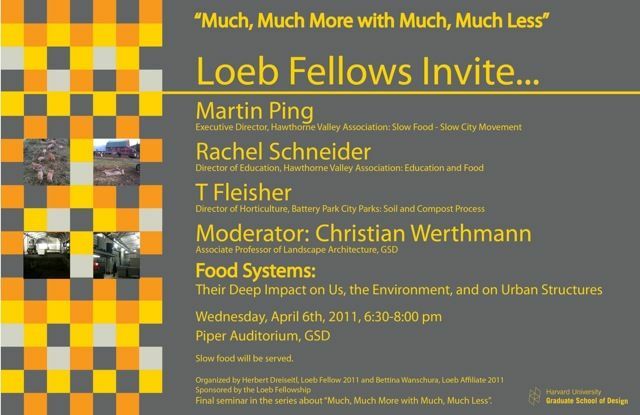 Cities will be incredibly green because we will, by necessity need to harvest rainwater, prevent runoff, shade streets. The effects on social and economic productivity will be enormous. The quality of human interaction will be enhanced. Having been through an era of evermore globally connected urbanism, with the consequently divisive effects of major traffic arteries on local communities and the throttling or urban centres by that 60s badge of honour, the ring road, we will move to an age of continuously connected, convivial, landscaped urbanism. For me, this can be summed up as a change from “transport planning” to “transaction planning”. This will necessitate an end of ages for the traffic engineer and the birth of an era of sophisticated, humane urbanism. In accepting the 2011 Kevin Lynch Award at MIT, Randy Hester gave a provocative speech about the enduring importance of urban design. Here is my tweetroll from the event. 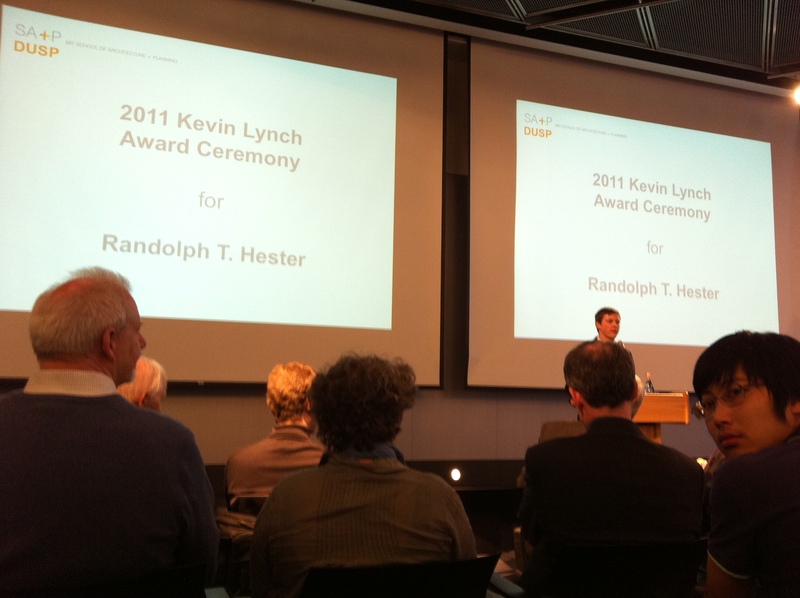 At the 2011 Kevin Lynch Award Ceremony @MIT Media Lab, intro by Andres Sevtsuk. RH – everyone may not care about greenhouse gases but everyone cares about #nature – concern for nature is the gateway to ecologicalism. RH – there is a paradox btwn ecology & democracy and a need to harness the paradox, leading to new, recombinant urban/ecological aesthetics. I spoke today to Dr Joyce Rosenthal’s “Environmental Planning & Sustainable Development” class at the Harvard University Graduate School of Design. My presentation “Carbon emissions & spatial connections” can be viewed on Slideboom.